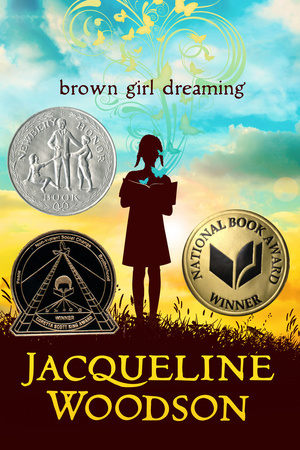 Brown Girl Dreaming has racked up an impressive list of awards since its release last summer - National Book Award, Coretta Scott King Award, Newbery Honor Medal, to name a few - and all well deserved. This middle grade memoir is written in flowing free verse and follows the author's childhood growing up between South Carolina and New York. An absent father, a long-distance mother, a religious grandmother, a cheerful aunt, a loving and independent grandfather, friends, teachers, siblings, all come to life in few, carefully chosen words. Tragedy, too, is simply and movingly expressed. The aunt who dies unexpectedly from a fall, the brother stunted mentally and physically by exposure to lead, the inevitable decline of loved ones due to old age. Events from the wider world creep in as well, filtered through a child's memory. She describes hearing about marching on the radio, avoiding downtown because of sit-ins, Black Panthers and Angela Davis. Early in the book Jacqueline directly addresses the unreliability of memory - an interesting choice for a memoir - with the story of her birth. You were born in the morning, Grandma Georgiana said. You came in the late afternoon, my mother said. You're the one that was born near night, my father says. amid other people's bad memory. Often times, small moments in childhood take on a disproportional influence on our future selves. Living with her grandmother in South Carolina, Jacqueline remembers getting on the bus and her grandmother walking them to the back, even after the laws changed. Constant tension runs through the book in the differences between Jacqueline's life in the South with her grandparents and her life in the North with her mother, between black and white, between the various choices people make, between her religious upbringing with her Jehovah's Witness grandmother and her love for her non-religious grandfather, whom she calls "daddy". a nicer more peaceful world. Some of my favorite sections show Jacqueline developing as a writer. Her awakening wonder at the moment she realizes she is able to write her full name - "Letters becoming words, words gathering meanings, becoming / thoughts outside my head" - is palpable and continues despite the skepticism of others. An influential teacher boosts her confidence with three words. I believe in God and evolution. I believe in the Bible and the Qur'an. I believe in Christmas and the New World.